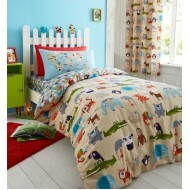 This cotton rich easy-care bed linen is perfect for any safari themed bedroom. With a cool geo rever.. 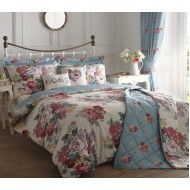 Inspired by 1960's prints, this retro floral bedlinen features an on-trend ochre backdrop with styli.. 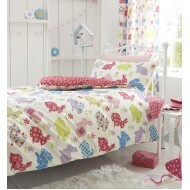 Bright, fun, Cotton rich bedlinen. Complete the look with co-ordinating accessories. The name Cat.. Brushed Happy Christmas Red Natural pure Cotton brushed for extra softness. 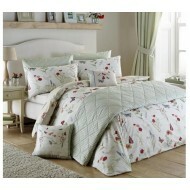 Warm, comfy and..
Cotton rich and easycare bedroom collection. Sweet and charming, a cute bunny rabbit print with..
A beautiful romantic and captivating print of butterfly stamps and “en vacances” memorabilia with a .. Cheerful and fun! 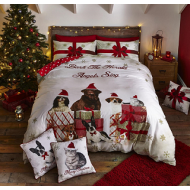 Unwrap this easycare Cotton Rich bedlinen with festive party animals. Matching acc.. Contemporary and urban; bedlinen designed to add style to your room with architectural silhouettes a..
Cotton rich and easycare bedroom collection. Bright and busy, a comic strip print with fun accessori..
Add glamourous sophistication to your room with this indulgent bedlinen collecti..
Add glamourous sophistication to your room with this indulgent bedlinen collection. Style with the c..